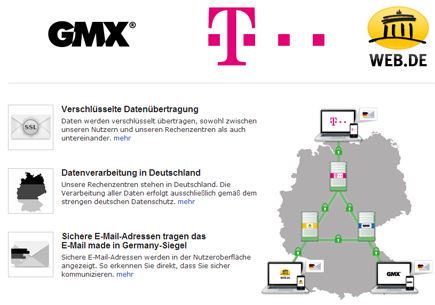 Deutsche Telekom, WEB.DE and GMX Launch Secure "E-mail made in Germany"
Deutsche Telekom and United Internet have launched an initiative for secure e-mail across Germany. The "E-mail made in Germany" program utilizes an additional security standard that for the very first time enables GMX, T-Online and WEB.DE users to automatically encrypt data over all transmission paths. The partners will also ensure that data are handled in compliance with German data privacy laws. A special designation allows users to see before dispatching their e-mail which of the recipients selected also use secure e-mail addresses and thus comply with the initiative's security standards. Beginning immediately, e-mail communication between data centers at GMX, T-Online and WEB.DE is being sent in encrypted form. Transmission from the handset to the e-mail server is already encrypted for all customers who use an e-mail application from one of the partners or who have activated SSL encryption in their e-mail program (e.g., Outlook). For security reasons, from the beginning of 2014 the initiative partners will only transport SSL-encrypted e-mails to ensure that data traffic over all of their transmission paths is secure. "Germans are deeply unsettled by the latest reports on the potential interception of communication data. Our initiative is designed to counteract this concern and make e-mail communication throughout Germany more secure in general. Protection of the private sphere is a valuable commodity," said René Obermann, CEO of Deutsche Telekom AG. American Tower Corporation will acquire up to 2,790 towers in Brazil and 1,666 towers in Mexico from NII Holdings for approximately $413 million and $398 million, respectively. American Tower said the majority of the portfolio consists of towers located in and around major population areas and along major highways. On average, the towers have a tenancy ratio of just over one tenant per tower, with Nextel Brazil or Nextel Mexico as the primary tenant, providing significant opportunities for future site leasing growth. Both Nextel Brazil and Nextel Mexico have agreed to leaseback the towers from American Tower for a minimum 12-year initial lease term with additional renewal options thereafter. NII International Telecom S.C.A, a subsidiary of NII based in Luxembourg, has agreed to provide certain credit support with respect to the obligations of Nextel Brazil. "Through this acquisition, American Tower will gain significant incremental scale in our Mexican and Brazilian operations, and we anticipate leveraging the strong demand backdrop in both markets to drive meaningful revenue and cash flow growth for many years to come," stated Jim Taiclet, Chairman, President and Chief Executive Officer of American Tower. American Tower currently owns and operates over 56,000 communications sites in the United States, Brazil, Chile, Colombia, Germany, Ghana, India, Mexico, Peru, South Africa and Uganda. América Móvil launched a tender offer in cash to acquire all of the issued and outstanding shares of KPN for EUR 2.40 per share. The offer represents a premium of approximately 35.4% over the average closing price of KPN's ordinary shares on Euronext Amsterdam for the last 30 trading days. América Móvil said the acquisition would give it the opportunity to expand to other regions outside the Americas in order to achieve geographical diversification and create attractive long-term returns for its shareholders. América Móvil aims to support to a greater extent KPN's plans in a rapidly changing environment in Europe so that both companies benefit from their respective experiences in the sector. Currently, América Móvil holds (directly and indirectly) 1,267,677,000 ordinary shares in the capital of KPN, representing approximately 29.77% of all issued and outstanding ordinary shares in the capital of KPN. 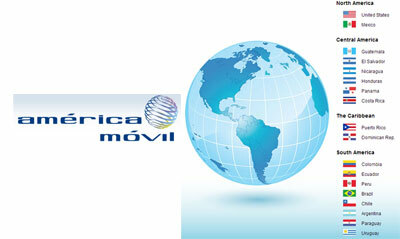 América Móvil also noted that it is evaluating KPN's proposed sales of E-Plus. On July 23, 2013, KPN announced that it had “entered into a transaction, subject to shareholder approval, to sell and transfer 100% of its interest in E-Plus to Telefonica Deutschland for EUR 5.0 billion in cash and a 17.6% stake in Telefonica Deutschland post transaction”. CyrusOne announced plans to build a second data center in San Antonio near its existing facility, which was commissioned in October 2012. The new site is expected to have more than 200,000 square feet of data center and superior Class A office space that can be used by customer employees. 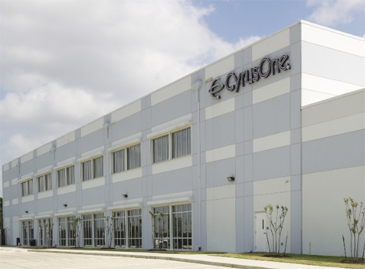 As a result, CyrusOne’s San Antonio footprint will grow to more than 300,000 square feet of data center and Class A office space. "As we anticipated, demand for colocation space in our existing San Antonio data center has been strong, and we’re excited to get started on the new facility,” said Kevin Timmons, chief technology officer for CyrusOne. “We anticipate breaking ground in the fourth quarter of 2013 and plan to use our innovative Massively Modular facility engineering approach to achieve construction and asset utilization efficiencies and enable a speedy commissioning of the site."